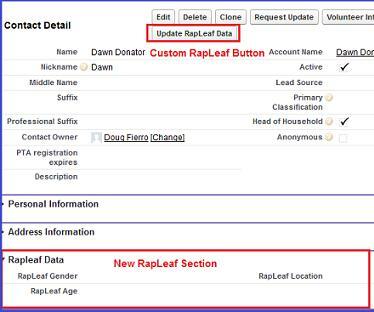 This application package provided by RapLeaf (http://www.rapleaf.com) installs in to the Convio Common Ground environment to provide basic constituent demographic fields at no charge - includes gender, age, location, income, occupation. Additional fields are available for a fee and are listed in the supplement PDF document provided with this download. Note that field data may not be available for all constituents. There are two methods to update the constituent records - one is a batch method that runs in the background across all constituent records, the other is through a custom button on the individual constituent record displayed. Both are real-time updates that connect to the RapLeaf database via API calls. Convio provides this third party download as a courtesy and in the hope that it will be useful. Convio makes no representations regarding this third party download, its quality, security, or any information related thereto. It is provided "as is" without any expressed or implied warranty. Any questions, customer support, or claims regarding this third party download must be directed to the third party download Contributor. Have a download of your own to share? Join our growing developer community and tell us about it. Free, open source CMS software can appear to be an attractive option, but is the total cost of ownership truly lower than a commercial product? View a comparison chart to learn more.